Oh My Beauties! I am super excited to write about a haul for the first time! I had a hundred dollar Amazon gift card; and used this to gift myself. Thanks god! that in this era of internet, we can always enjoy a 'shopping spree' from home, especially when there is such an excuse called 'Christmas'. Lol! Again, I did not order anything which had huge sale online for the occasion. 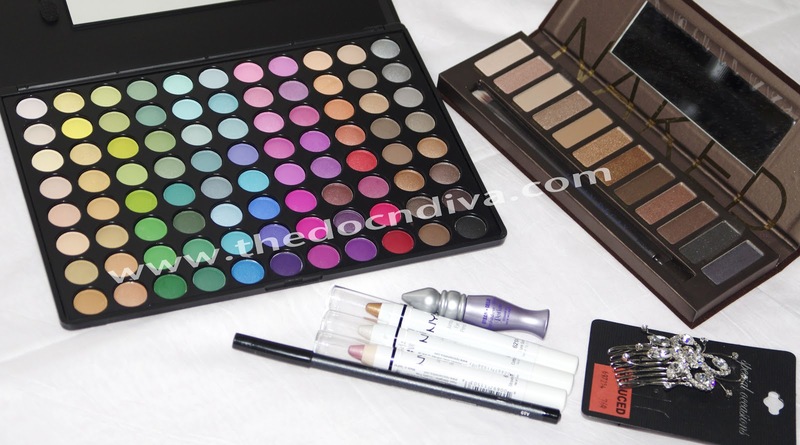 I took this opportunity to enjoy and order some makeup goodies that I have been thinking about buying for sometime. And here are they... Enjoy! November was Doc's birthday month! The special day was on a working day, so we celebrated the weekend before! It was a family celebration. We went to a nearby state park to see fall color and then for dinner. Again with Auripra, I had minimum time for myself to get ready. As we were going out for 'day to night', I needed to do an eye make up which should be wearable during day and at the same time glamorous for night and of-course very easy and quick to do. Therefore, I came up with this look.